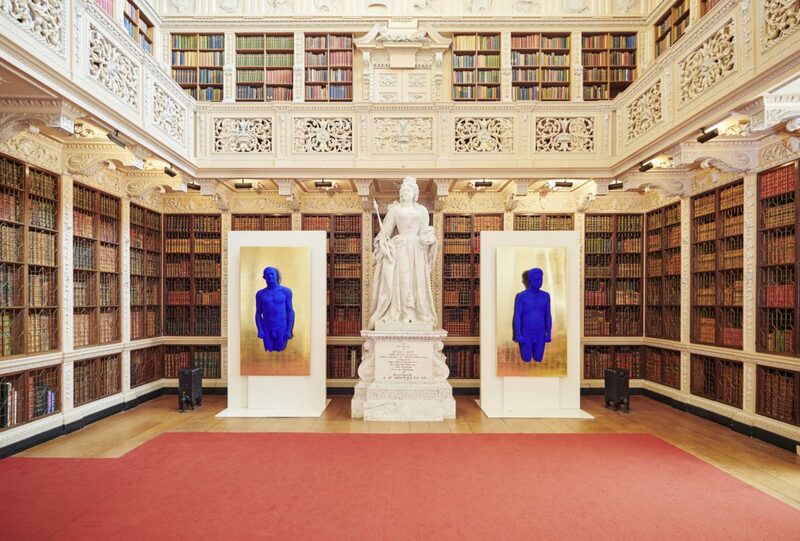 This week, Blenheim Art Foundation launched Yves Klein at Blenheim Palace, a solo exhibition by the visionary French artist, running until 7 October 2018. The exhibition, which is presented in collaboration with the Yves Klein Estate, coincides with what would have been the artist’s ninetieth birthday year. It explores concepts of beauty, sensibility and the sublime, offering visitors a unique opportunity to view Klein’s seminal artworks in the landmark setting of the World Heritage listed eighteenth-century palace. Featuring over 50 artworks, this is the most comprehensive exhibition of Yves Klein’s practice in the UK to date. Something Curated spoke with Antonia Jolles, Senior Exhibitions Manager at Blenheim Art Foundation, to learn more. Something Curated: Can you talk to us about your journey into the art world? Antonia Jolles: I started my career working for an Old Master dealer, and then went on to work for a contemporary gallery in London, but quickly realised that I was far more drawn to the exhibition side of things. I joined Blenheim Art Foundation in 2014 – right at the very beginning – and started working on the first exhibition, Ai Weiwei at Blenheim Palace. Since then I have been managing the annual exhibition programme, which has presented some of the largest UK shows to date by Lawrence Weiner (2015), Michelangelo Pistoletto (2016), Jenny Holzer (2017), and this year, Yves Klein. SC: Could you give us some insight into your responsibilities as Senior Exhibitions Manager at Blenheim Art Foundation? AJ: My main responsibility is to work with the artists and their studios to help turn their vision for the exhibition into a reality. This takes up a surprising amount of time, as working in a UNESCO World Heritage site often presents install challenges that you wouldn’t encounter in your average white cube exhibition space. When it comes to actually installing the shows at Blenheim it’s not always as straightforward as having a crew of art technicians simply place or hang an artwork – each installation is generally the product of hours consulting and problem solving with specialist subcontractors, and the various internal departments at Blenheim to make sure that everyone, including the artist, is happy with the outcome. Suspending Ai Weiwei’s 5 meter tall Chandelier, Pistoletto’s Third Paradise, and a robotic LED sign by Jenny Holzer in the Great Hall without being able to drill a single hole to secure any of them, was no mean feat. Aside from the production of the physical exhibition, I’m also responsible for managing all things exhibition related, which could mean anything from the editorial coordination of our catalogues to budget forecasting. SC: Can you introduce us to the upcoming Yves Klein show? AJ: This is the first time that Yves Klein’s work has ever been presented outside of a gallery environment, in a setting like Blenheim. 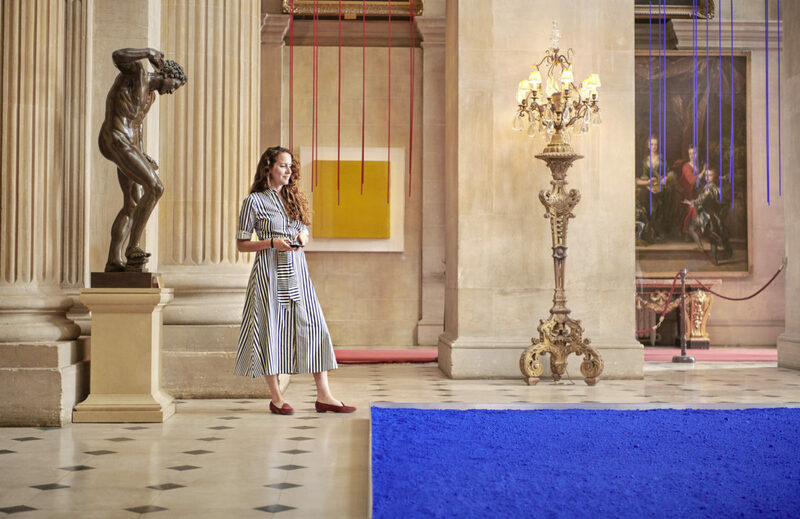 The exhibition will explore beauty, sensibility and the sublime and will offer visitors a unique experience of both Yves Klein and of the Palace. 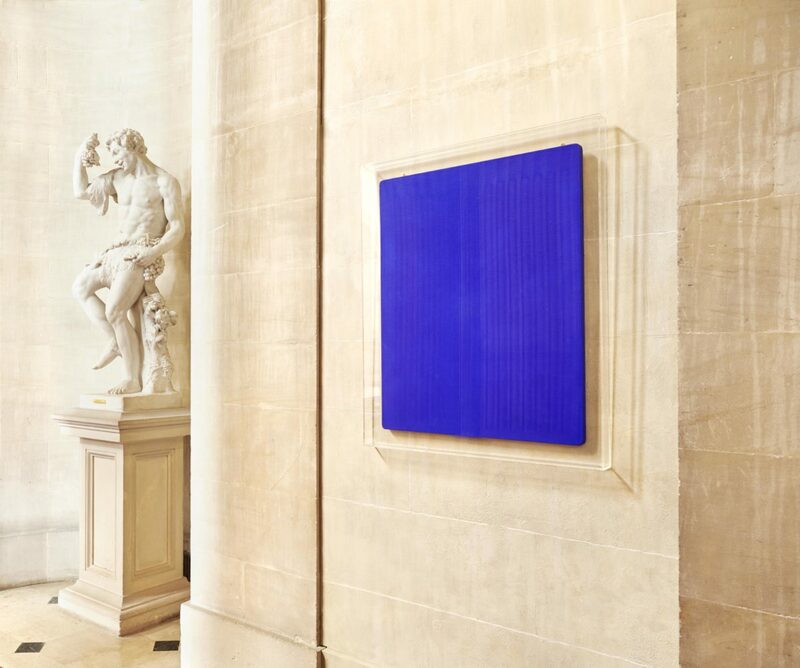 In terms of artwork, it will be the largest exhibition of Yves Klein in the UK to date, including works from his early Monochrome period right through to the Fire Paintings and Relief Portraits, displayed throughout the baroque interiors. SC: Why is it important that we look at Yves Klein’s work right now? AJ: Yves Klein was one of the most radical artists of the 20th century and his practice is still as relevant today, continuing to influence art, fashion, design, music and more. It is also a landmark year for the artist – 2018 would have been Klein’s 90th birthday year – and this is something we are extremely excited to commemorate. SC: Is there a piece of work that you are particularly excited to be able to include? AJ: We will be presenting a 7m x 7m installation of blue pigment covering most of the floorspace in the Great Hall; it will be the first piece people see when they walk into the Palace, and it’s definitely going to be a showstopper. 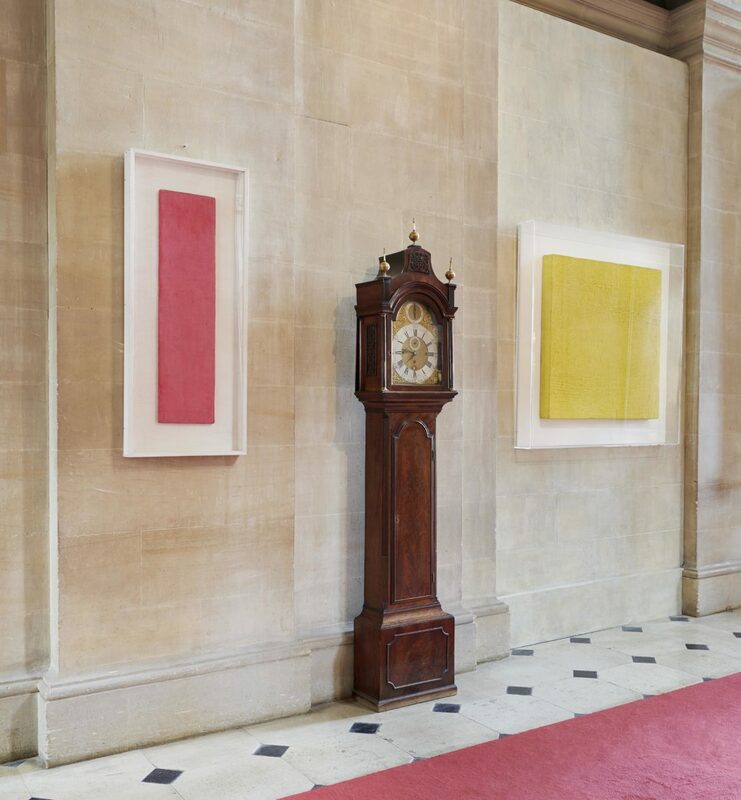 SC: What are the challenges of displaying modern and contemporary artwork in a historic setting? In the same respect, what are the rewards? AJ: As I mentioned before, there are lots of practical challenges to avoid damaging to the Palace, you can’t drill any new holes to hang artworks, there are weight restrictions in every room, and even getting the larger pieces up the front steps and into the Palace isn’t always straightforward! Being open to the public 364 days a year can also make installing a bit tricky and so it often needs to be done at night. It’s always rewarding to see the show finally up and experience the reaction from both the artist and the public. Jenny Holzer’s light projections were a particular highlight: they were the largest and most ambitious production of projections she has ever done, covering the front of the Palace and Queen Anne’s Island in the lake out in the Palace grounds. The projections were all first-hand accounts of war, taken from the testimonies of over 50 war veterans that we interviewed and who had served in recent conflict, Save the Children, and Human Right’s Watch. Some of the veterans actually came to the show and it was incredibly moving to see their reactions. I think for a number of them, taking part in the whole process was extremely cathartic. SC: How does BAF go about selecting artists to exhibit at Blenheim Palace? AJ: BAF strives to present exhibitions that speak to today’s society, collaborating with artists who challenge conventional thinking and have had a significant impact both on art history and on the world around them. Our work is about artists creating an active dialogue with the Palace and introducing new ideas and perspectives. We want to give people a different experience of Blenheim and provide an opportunity for visitors who may not normally visit a contemporary art gallery to experience work by some of the world’s most influential artists in the unique setting of the Palace. SC: What are your exhibition highlights for 2018 – at Blenheim or elsewhere? AJ: Obviously Yves Klein at Blenheim, which has just opened! But also Christo’s The London Mastaba on the Serpentine. I am absolutely obsessed with his work – he is the ultimate master of ephemeral and large-scale installation. AJ: I have just finished Red Notice by Bill Browder. I don’t think I’ve read a book that fast since the last Harry Potter.